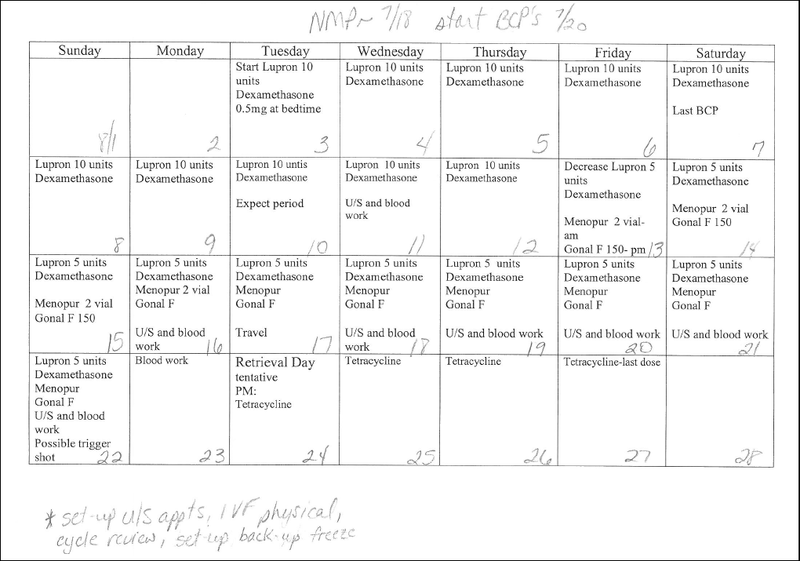 Below I’ve added links to my recaps of the major components of an IVF cycle with CCS testing, Depot Lupron treatment, and an FET. I thought having these links in one spot might provide a clearer picture of what to expect from cycling at CCRM, but you can also click one of the Categories on the right pane of this page to see more. I just scheduled my latest suppression check, which will be Wednesday morning. I wanted to give my body a couple of days to rid itself of this dumb cyst! 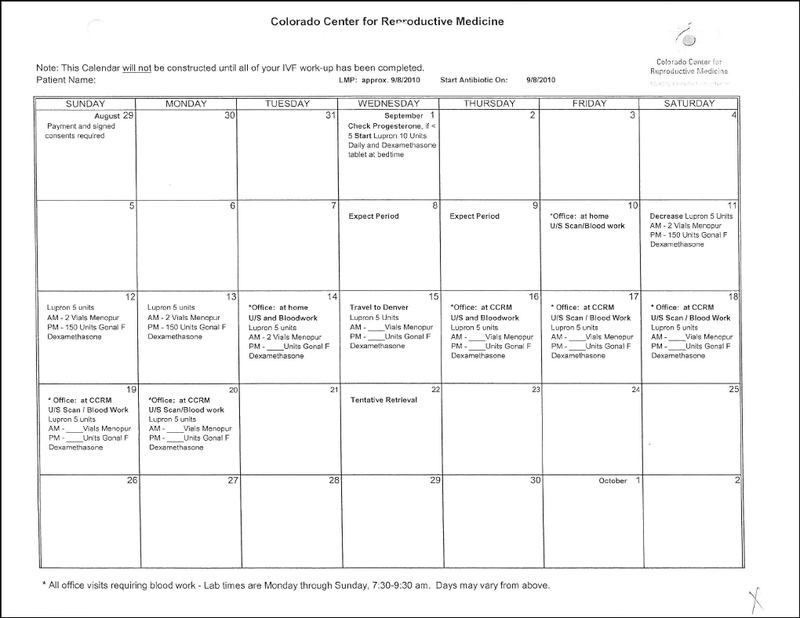 Hopefully this is the last egg retrieval calendar I will EVER receive (click to enlarge)! Here we go… Calendar Number 5109890. (just joking, ha! Kinda feels that way though.) Obviously I removed our personal info and it’s not very detailed because everything is so tentative until AF shows up after this whole prometrium business, but it gives me an idea of when to expect the ball to start rolling (click to enlarge). 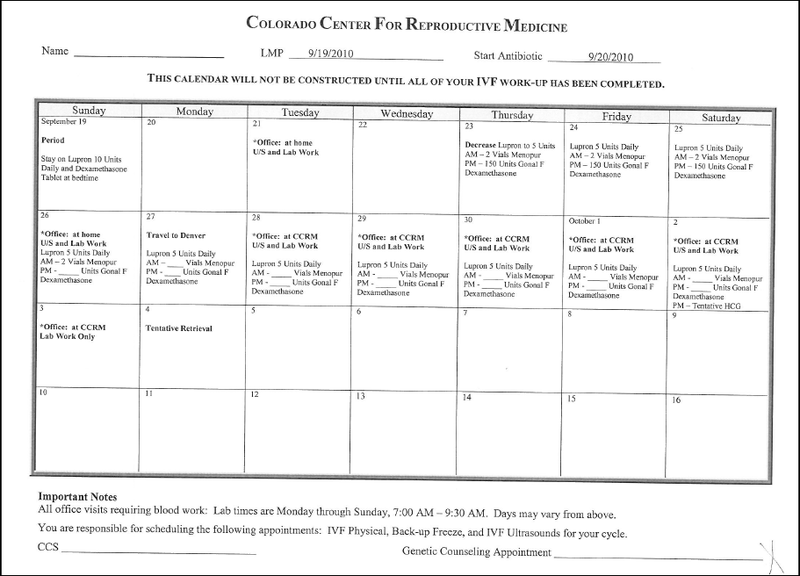 The image below is my newest IVF calendar (click to enlarge). Hopefully it will stick this time! I removed our names, but otherwise all details are there! 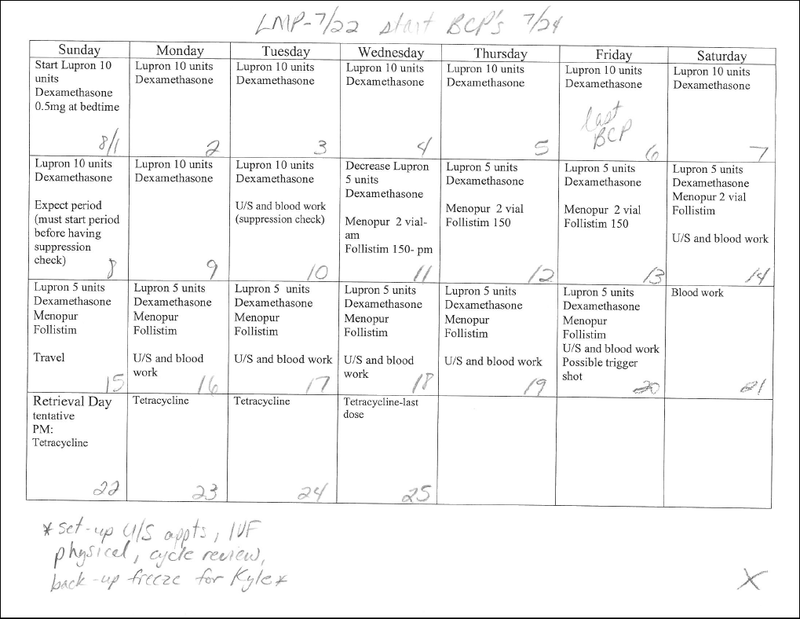 The reference to start an antibiotic on 9/8 is for my DH; I just removed his name from its position next to the date. 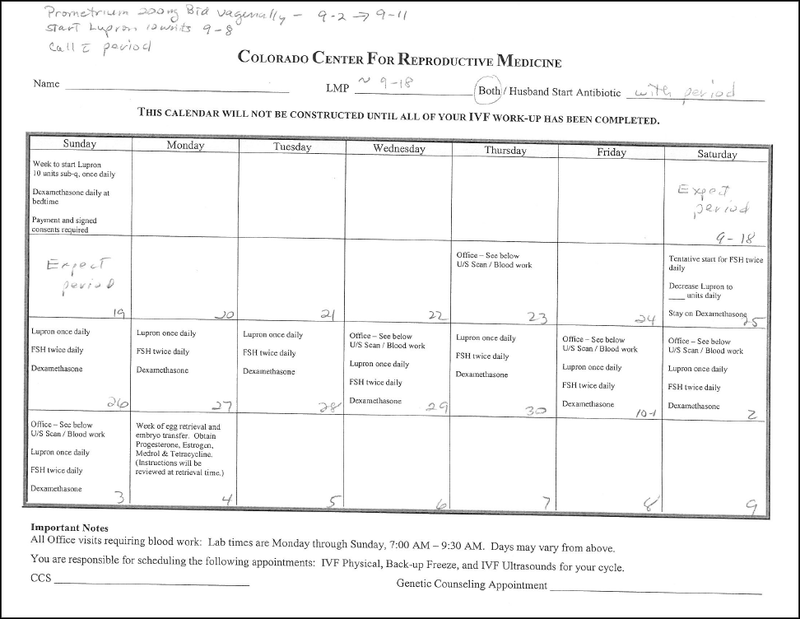 If I pass next week’s progesterone check, I’ll need to start making our travel arrangements and scheduling all of our appointments. I’m already freaking out because my dad is scheduled to stay at our house the weekend of September 18th. He lives in upstate NY and is visiting my state for a work conference, and he extended his flight by a few days to spend more time with us. What the heck am I going to tell him? No family/friends IRL (except one who previously cycled at CCRM and our managers) even know about our plans. I’m sure my DH will help me to think of a way to resolve the problem. Last week I had to be a pain in the rear and ask our nurse if she would be willing to move up the dates on our calendar by a couple of days. My DH starts grad school on 8/25, and my tentative ER date was 8/24. 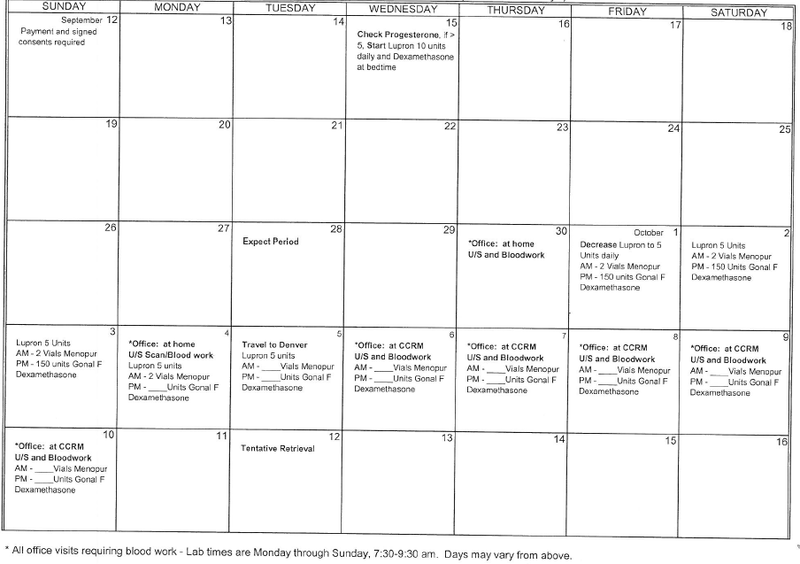 Dr. Surrey agreed to move up our tentative ER date to 8/22, and I received my new calendar yesterday afternoon (click to enlarge). There’s obviously still a chance that I’ll stim longer than expected and he’ll miss his first week of class, but that’s a risk we’re going to have to take. I can’t travel to Denver any earlier because DH’s entire family will be attending his best friend’s wedding on 8/14, and I would be missed (DH is the best man). We’re not telling any friends/family about this IVF, so I don’t want to raise suspicions. 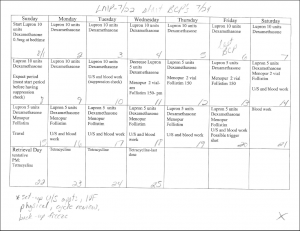 starting Lupron a week from tomorrow! I feel like our care is in the best possible hands and that our embryos will be at the best possible lab, so we are doing all we can to attempt a healthy pregnancy. Part of me really wishes that we were adding CCS screening, but Dr. Surrey assured me during both the ODWU and my initial consult that he didn’t feel it was necessary when considering our age (28 and 27) and with the results of my bloodwork. I’m just going along with his advice (he is the expert, after all), but if our cycle fails, I think I will really regret not pushing harder for chromosome testing. Hopefully AF arrives on time next month so that we can just get the show on the road! 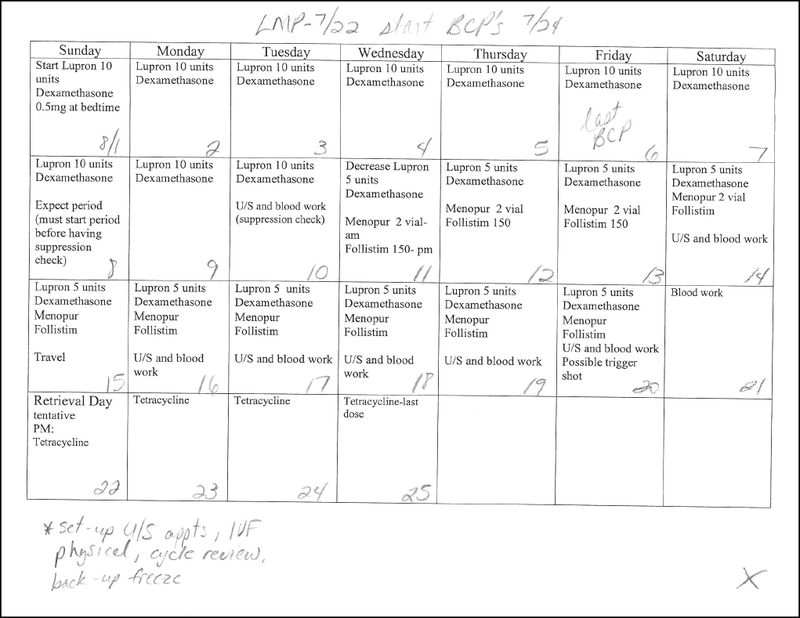 My tentative ER date is two months from tomorrow, which does not seem far away! Today is actually my fourth whole day of consuming ZERO caffeine. Considering that I’m a recovering caffeine addict, this is an achievement. I’m embarrassed to say that I continued to drink a little caffeine throughout IVF #1 and also before our ODWU. I used to get headaches if I failed to properly caffeinate myself, and I would always give in and drink a soda. A few months ago, I began to slowly wean myself from it. First I eliminated my morning coffee (which was pretty easy since it’s been near 100 degrees here lately), and then I started decreasing the amount of diet soda I was drinking. On Sunday, I decided to do a “test run” to see if I could avoid caffeine all day without getting a headache. And I haven’t had a headache or a drop of caffeine since Saturday! I’m also working on reducing sugar in my diet and increasing green leafy veggies. We’ve been eating salads, spinach, broccoli, and green beans galore lately, and I’ve been drinking tons of water. I know it may seem like much, but I could not even remember the last time I went an entire day without any caffeine at all–let alone four days! My regular nurse is apparently off the rest of the week, so Tonie got busy creating my calendar and sent it to me last night. Obviously, the dates could change a little depending on my irregular cycles, but it’s exciting to have an actual retrieval date, no matter how tentative it may be! tentatively retrieving my eggs on October 12th! In just ten weeks, I’ll be expecting AF to mark the beginning of that cycle. Considering that we’ve been counting down the weeks for a year now, that doesn’t seem like a very long time at all! Best of all, this schedule will most likely allow me to be at home for our wedding anniversary on October 18th! : ) I am a happy girl today.